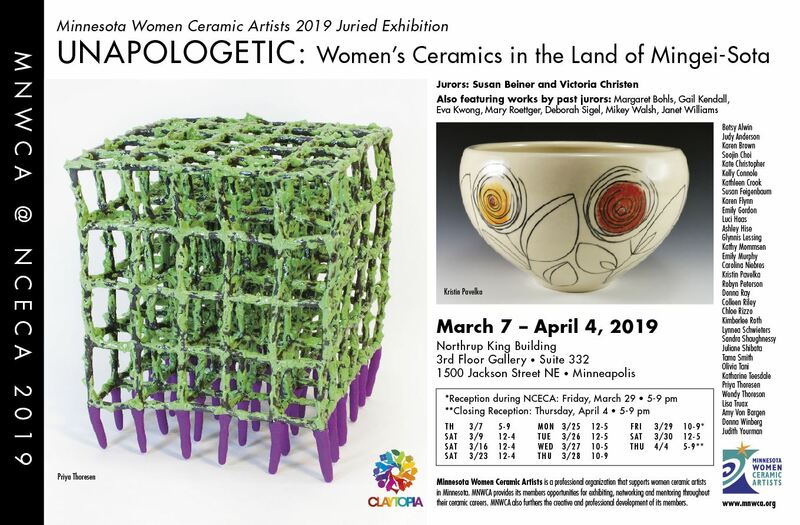 Welcome to Minnesota Women Ceramic Artists! Membership is open to ceramic artists of all levels who identify as women, living/working in Minnesota. We also welcome artists from North and South Dakota, Western Wisconsin and Northern Iowa. For more information, please visit the about/contact page. NCECA 2019 is coming to Minneapolis March 27-30 and we'll be there! We have two exhibitions on view during the conference. Heroines, Hops and Hounds. Members' drinking vessels exhibition and fundraiser. March 24-30, 2019 at Lakes and Legends Brewing (a high-traffic location just steps from the Convention Center!). Unapologetic: Womens' Ceramics in the Land of Mingei-sota. Members' Juried Exhibition. March 7 - April 5, 2019 at the Northrup King Building 3rd Floor Exhibition Space. Celebrating MNWCA's 10th Anniversary! Members: please submit your news to mnwca.communications@gmail.com (mark subject as "member news item"). Please include the following: your contact info, a well-written synopsis, times, dates, location, and a quality image. Due to space and time limitations, we cannot guarantee publication.